According to IDC’s 2015 Enterprise Datacenter Survey, over 35% of respondents said that downtime caused by human error was a problem they experienced in their data centers. Other challenges in the data center included downtime due to system failure, latency issues, regulatory or compliance issues, and insufficient bandwidth into or out of the data center. Yet despite progress in infrastructure innovation leading to faster deployments and leaner operational costs, organizations continue to struggle to deliver at the speed of business. In fact, IDC predicts that in 2017, 80% of enterprises will not deploy software-defined data center (SDDC) technology on schedule due to failure to plan around capacity constraints in critical facility infrastructure that delay transformation efforts. Additionally, more data centers are being built in new locations, often away from headquarters and critical business systems. Combine this with factors like big data and IoT applications exponentially increasing the amount of data that need to be stored, analyzed, and progressed, and the ability to remotely manage lights-out data centers effectively becomes more important than ever. Cooke not only shared IDC data center insights but also moderated the webinar’s guest panel discussion, featuring data center experts with hands-on experience managing their lights-out data centers remotely. Michael Piers, Senior Manager, Deployment & Infrastructure, shared how DCIM enabled him to manage deployments of new services in a number of data centers for major organizations like Comcast and Anthem, while Joe Keena, Manager, Data Center Operations, UF Health Shands, shared his experiences in the implementation and deployment of DCIM solutions. Attendees gained real-world, practical tips from experts who use DCIM to facilitate data center remote management. Register to watch the webinar recording, or read on for our six key takeaways on how to overcome the uncertainty of managing a data center when no one is on site. 1. Look for a data center management tool that does more than asset management. Piers and Keena both moved on very quickly from basic asset management to connectivity and monitoring in their data centers. “A repository for everything – how it’s physically located in the data center but then also how it’s connected in it – was something that we didn’t have other than in multiple spreadsheets or Visio drawings. The repositories were numerous and not consistent across the company as we had different teams managing different parts and pieces,” said Piers. So positioning DCIM as a single source of truth not only created consistency and alignment across the organization but also ensured higher data quality. “While we had an initial problem of just tracking assets correctly, you quickly realized that you have to evolve beyond that into connectivity and eventually into monitoring the data center space to make sure that you aren’t running into cooling or power capacity issues,” said Keena. In Keena’s case, DCIM created opportunities for predictive analysis to identify and prevent problems before they happened. A comprehensive DCIM solution will provide features that address both operations and monitoring to address both current and future considerations. 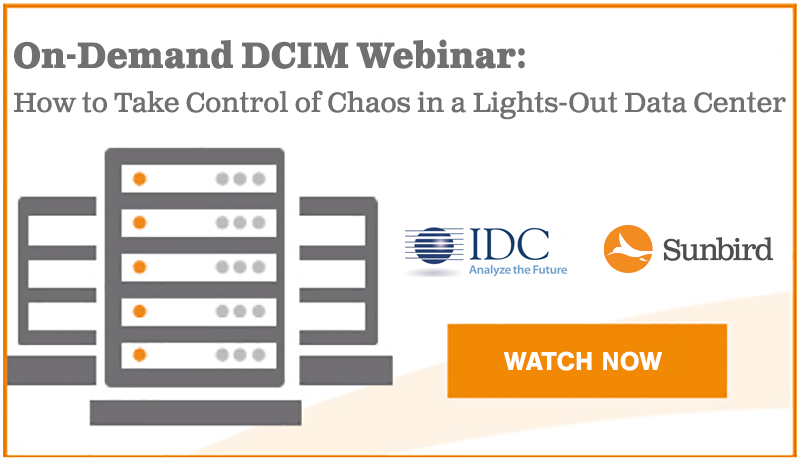 In fact, as Cooke noted during the webinar, IDC believes that investing in solutions that enable dynamic asset management, real-time power and environmental monitoring, and advanced and predictive analytics capabilities – many of the features offered by DCIM – is critical for SDDC transformation. DCIM helps organizations grow and adapt to changes in their IT resources and their data center environments. 2. DCIM can speed time to deployment and help you plan ahead. For both Piers and Keena, DCIM helped them rapidly plan out and build the infrastructure for their data centers, even though they did not have dedicated teams. Piers was able to build the critical infrastructure into DCIM for 49 locations (25 new data centers as well as 24 additional sites), with roughly 20,000 IT assets, in about a year. When building out his second data center site, Keena used DCIM to plan the racks not only in terms of the floor layout but also what the racks would look like once fully built out with equipment. DCIM helped Keena model each individual rack and then run reports to make sure that there would be enough power and space capacity to accommodate the equipment. 3. DCIM can help break down silos across the organization, but it can take some time. One lesser-known benefit of DCIM is that it can improve the collaboration between the data center team and IT. For Keena, implementing DCIM helped him to work better with the IT teams at Shands, particularly from the connectivity standpoint. “We became a partner with the rest of IT for helping them troubleshoot issues that were going on more at the logical level,” said Keena. If IT was experiencing poor response time with a particular server, DCIM became a troubleshooting tool that enabled them to see if the performance issue was caused by a switch, or if other servers on the same switch had the same issue. As a result, IT was able to pinpoint the causes of issues much more rapidly and accurately. A collaborative partnership also helps to not only speed time to deployment but drives user adoption and builds confidence across the organization. While not all teams may believe in the tool at first, as the data is shown to be accurate, reports are faster, and the value of DCIM is proven, more teams will get on board, share their own data, and use DCIM as a single source of truth. 4. In the dawn of SDDC, remember that you’re still managing hardware. Software-defined data centers (SDDC) and software-defined infrastructure (SDI) seem to be the next big trend in infrastructure innovation. However, data center managers still need to look for software that makes it easier to manage the hardware in their data centers. That’s where DCIM came in as a tool to manage the future as well as current activities. DCIM not only helped Keena track his assets and model out his new data center, it also allowed him to fine-tune his power, cooling, and space capacity predictions with greater accuracy. This led to more confidence from the upper management team and made it easier for Keena’s team to get buy-in for future investments. 5. Don’t underestimate the people problem. Both Piers and Keena agreed on the number one challenge in their data center deployments: people. “The biggest implementation challenge for us was getting people to change,” said Piers. “They’re used to doing Visio drawings and spreadsheets.” As a result, it was difficult to shift from these manual processes to entering information into the DCIM software and creating work orders within it. So how can data center managers overcome this challenge and manage change? 6. Partner with a vendor willing to work with you beyond the purchase. A vendor who is a trusted partner and who is willing to offer post-purchase support is essential to DCIM success. For Piers, working with a vendor who was willing to consider his use cases was critical, particularly considering the significant up-front investment required for DCIM solutions in terms of both money and time. He wanted a vendor invested in his success, and he found that with Sunbird. “Instead of pointing us to another product, [Sunbird] just said, ‘Yeah, we can do that,’” said Piers. With data centers and their assets becoming more distributed, it’s more critical than ever for data center professionals to be able to adapt and remotely manage a lights-out environment. Whether you’re transitioning to a data center with no one on site or simply want to manage your data center more effectively, these tips and insights from data center experts can help you reduce the uncertainty in your data center and ensure a successful DCIM implementation. Want more ways to explore the benefits of DCIM? Watch the webinar here, and then test drive Sunbird’s DCIM software for yourself today.